Balance skin and decongest pores. This gel mask combines charcoal to draw out impurities and natural clays (kaolin and bentonite) to absorb excess oil helping to minimise and decongest pores. The easy to rinse gel formula also contains willow-bark and glycerin to soothe and lightly-hydrate skin, leaving it smoother, clearer and more balanced. Use on clean, dry skin. Apply a generous layer all over face and let dry for 10-15 minutes. Rinse thoroughly with tepid to warm water. Use as often as needed. Miracle mask, treat my skin from acne. The mask is good. Really cleansing my pores. Charcoal has unique absorbent properties that allows dirt and excess oil to be removed without causing dryness. Aqua, Tapioca Starch (absorbent/texture enhancer), Glycerin (skin-replenishing), Decyl Glucoside (cleansing agent), Sodium Lauroyl Sarcosinate (cleansing agent/emulsifier), Butylene Glycol (hydration), Cocamidopropyl Betaine (cleansing agent), Ammonium Acryloyldimethyltaurate/VP Copolymer (texture enhancer), Bentonite (absorbent), Kaolin (absorbent), Charcoal Powder (absorbent/coloring agent), Boerhavia Diffusa Root Extract (skin-soothing), Bisabolol (skin-soothing), Epilobium Angustifolium Flower/Leaf/Stem Extract (skin-soothing), Lactic Acid (hydration), Xanthan Gum (texture enhancer), Isopropyl Titanium Triisostearate (slip agent), C12-15 Alkyl Benzoate (texture enhancer), Iron Oxides (coloring agent), Phenoxyethanol (preservative), Caprylyl Glycol (preservative), Ethylhexylglycerin (preservative), Hexylene Glycol (preservative). 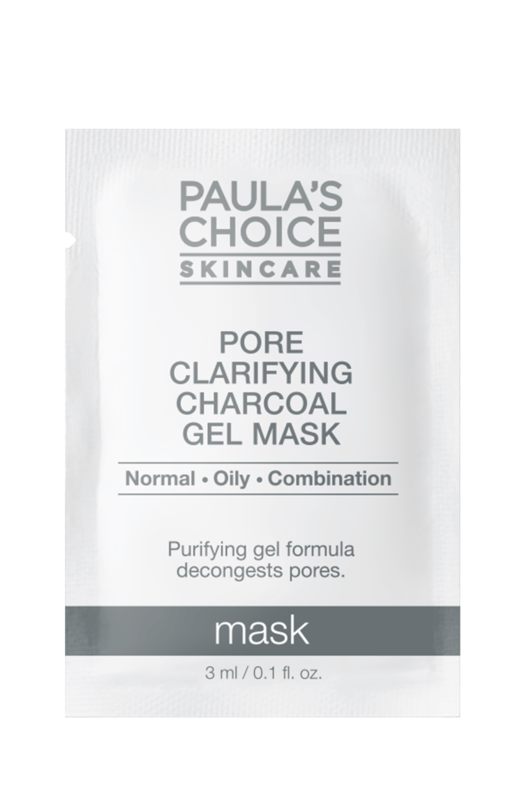 What's the difference between the Pore Clarifying Charcoal Gel Mask and other Masks of Paula's Choice? The biggest difference between the Pore Clarifying Gel Mask and other Paula's Choice masks is the texture. It feels lighter on the skin and has a super-soft finish after drying. This is different from Skin Balancing Mask which has a thicker clay texture. The Pore Clarifying Charcoal Gel Mask has a unique combination of ingredients that allow for optimal oil absorption while leaving the skin feeling soft and soothed.